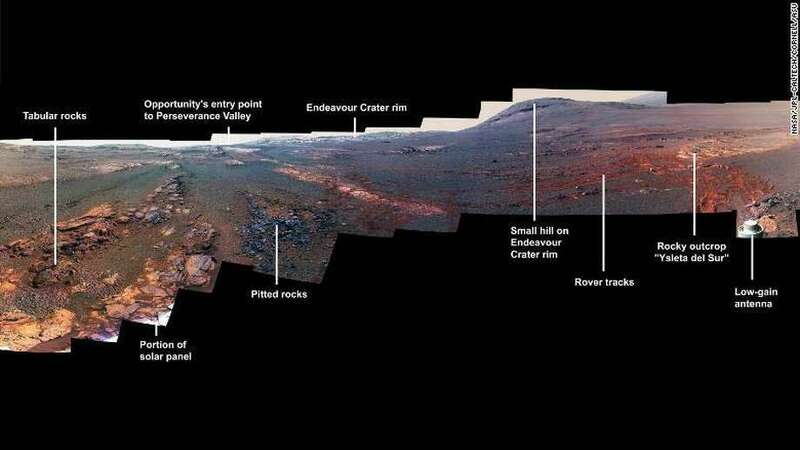 This is a panoramic view the Opportunity rover took with its Pancam over Mars from May 13 through June 10, 2018. The rover recently quit responding to signals. As this is being written, spring temperatures are arriving and groups are coming to visit the John J. McCarthy Observatory. Things are getting busier. We love busy. At our monthly Second Saturday Stars event, we were delighted to see so many students ages 7 to 17. Cub Scouts and Boy Scouts, Brownies and Girl Scouts and their families attended. We had a clear night and much to observe. If you have never attended our monthly star party —always held on the second Saturday of each month — give it a try. There’s lots to do, lots to see, and we never charge for community usage of the observatory. As you likely have read, the amazing Opportunity rover “Oppy” on Mars has finally quit responding to signals, having been the victim of an enormous many-month dust storm on the Red Planet. It so far exceeded its intended mission duration and our knowledge of Mars that we can only celebrate the many years and many kilometers of the red planet's surface it explored. Over 45 kilometers in over 14 years of active duty. The science data collected and sent home will take decades to study and help in the planning for even greater missions. In space news, The Milky Way galaxy is much heavier than thought. Scientists using information from the Hubble and GAIA space telescopes have updated calculations of the mass of the Milky Way. This is “the most accurate measurement yet of the mass of the galaxy,” achieved by studying the motions of star clusters orbiting the Milky Way. The new mass is calculated at about 1.5 trillion times the mass of our sun. Of course, the vast majority of the Milky Way's mass is invisible, made up of dark matter, not the objects we can detect. Hopefully scientists will figure out what that “stuff” is in the next decade. Our knowledge of the makeup and shape of the Milky Way evolved a great deal since we built the observatory in 2000. Then it was believed to have a concentrated central region. Then the discovery that it is a barred spiral. Then came the possibility that it might be larger. Now it is much heavier. Our prediction: whatever we teach our audiences now will be proven wrong. We love that. It is progress - our tax dollars at work funding great new technologies, and very bright people using them to make discoveries at a breathtaking rate. A news flash as of March 13, exoplanet hunters have just verified the 4,000th planet around other stars! As that population grows, so does the population within it of potentially habitable planets. In other happenings at the observatory, our adult ed class, which is family friendly, began two days ago. We have had two classes per year since the spring of 2001, without a gap. As the years have gone by, the tools for explaining the heavens without being bogged down in technical terms have evolved so much, we can truly build a fundamental knowledge of what is out there, where it all is, and why. If you’d like to learn more, email adulted@newmilfordps.org.